Came across this from pro softball star Monica Abbott. Sound advice not just for future collegiate softball players, but for everyone. Chances are, especially if you are or have a child from ... let’s see ... 8-18, you’ve heard of The Hunger Games, the popular young adult trilogy by Suzanne Collins as well as the first movie based on the books released on March 23, 2012. As with just about anything marketed today, especially something where the initial audience is Generation Digital -- those young teens who live and breathe on social media and online communities, who have known only a world of sharing on Twitter, Facebook and tumblr -- there must be appropriate planning and consideration given to a social media marketing campaign. The Hunger Games formulated a comprehensive social media playbook and successfully implemented that plan to maximize the technologies available, utilize the built-in fan base from the books and fully leverage the power of interactive media effectively. Lionsgate and the team behind the marketing of The Hunger Games did their prep work, they had a plan in place and executed that plan to record-setting perfection. Pre-game: For a little background, check out this article from The Toronto Star. First, I want to being by stating I am not here to argue the merits of each sides’ claims, assign blame or take sides. I am strictly looking at this from an iMedia perspective, analyzing how the sides made use of the tools and whether or not, in my opinion, they used them correctly – a little ‘Saturday Morning Quarterbacking’ so-to-speak. When it comes to the new media, social media space, it is key not just to be first, but be credible. The players nailed both. As for the message, social and interactive media provide a difficult challenge, getting your point across in the narrow space constraints of a tweet, status update or blog post. The players used the tools more effectively, remaining engaged with fans, stating their side of the story, answering questions quickly. They did not hide, they did not wait – the faced the controversy and addressed it promptly. Talk about a penalty -- the league broke one of the cardinal rules of the new media space – Thou Shalt Not Censor the Conversation. Look, I understand organizations and brands wanted to protect their interests – and negative reviews and comments don’t really help advance that goal. However, deleting comments just because they are negative, or they disagree with you or you just don’t like what they said is not how the new media game is played. The advantage of the platforms, like Facebook, is the interactivity, the two-way conversation. The point is not to just silence your critics via deletion, but to engage and learn from them, converting critics into fans if possible. Censoring the conversation causes your organization or brand to lose credibility in the new media world, something that is nearly impossible to get back. Instead of deleting negative comments and banning their authors, a simple reply of “The LFL and Toronto Triumph will be issuing a statement in the near future regarding the claims made by former Triumph players.” A response like that, heck, ANY response is a better practice in the new media space rather than what the LFL and the Triumph did – deafening silence coupled with censorship and manipulation of the conversation. The players leveraged the new media and social media tools effectively, much to their benefit. FSU ‘axes’ social media – right play or wrong call? From the headline alone, as an interactive media professional, my first thought is – “Not a smart move.” As a general rule, you never want to cut off your interactive communication channels, your social media. Whether the feedback and comments are positive or negative, the interactive nature of social media is a powerful tool when used properly; a tool you do not want to be without nor give up. Reading further explained why the decision was made to cease social media. Seminoles coach Jimbo Fisher said he did not ban the use of Twitter and Facebook, surmising that the players voted on the ban during a players' only meeting Sunday night. It seems that it was a decision made by the players and the players alone in response to the negative feedback some fans were shooting their way during the Seminoles three-game skid this season. "Obviously right now it's kind of negative. ... It was a joint effort. Everybody understands that we need to focus in and not be up at night worrying about Twitter or be up at night worrying about Facebook. Focus on what we have to do. Twitter and Facebook is just extra stuff that we don't need right now." Now, you can argue the merits of the reasoning behind the decision to ban social media, from the “focus in” and ‘eliminate the distractions’ standpoint, from the fostering a healthy environment for young players and men to develop … but that is for another time and place. Here, what we are concerned with is looking at the decision to ban from the standpoint of interactive and social media strategy and best practices. Simply put, as a general rule, cutting off social media and interactive feedback channels in the face of criticism is the wrong play call. You lose credibility in and trust from the new media space when you shut down your social and interactive media channels when confronted with negative feedback. Instead, organizations need to use the opportunity to engage in conversation those lobbing criticism their way, learn from them to make your organization better. Being honest and open, not running from criticism but facing it head on and working collaboratively with your fans on making things better is where the true power of interactive media is leveraged. *I do want to note that there are exceptions to every rule. Careful, deliberate examination of your unique situation and circumstances by a trained, experienced interactive and social media professional will help ensure that your organization makes the winning call when it comes to leveraging interactive and social media. 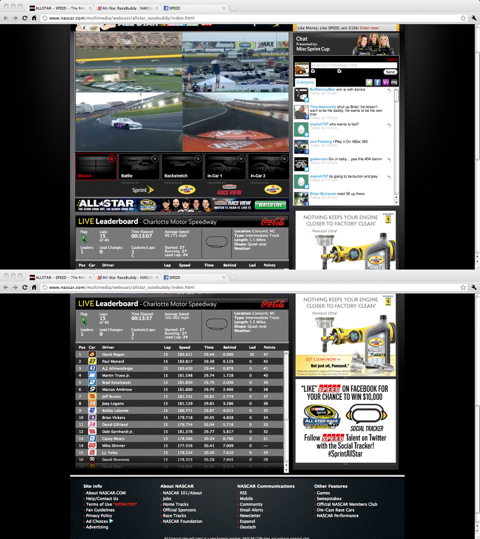 I wanted to highlight some excellent iMedia integration from SPEED and NASCAR.com and their coverage of the 2011 Sprint All-Star Race. 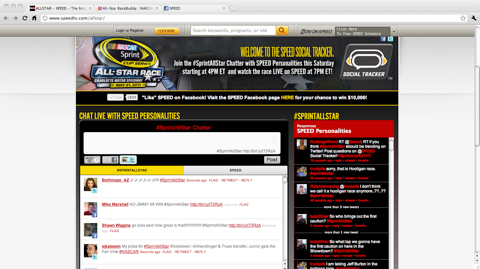 SPEED has their on-air personalities tweeting and interacting with fans, a Facebook contest, and photo updates. NASCAR.com has the Miss Sprint Cup trio interacting with fans on RaceBuddy. Nice incorporation of Facebook and Twitter chat, integration with streaming video - great use of the technology to enhance the race coverage.